I like to have the occasional bet on the big soccer games or the Super Bowl, but, to be honest, I'm not confident enough to risk too much money. Well, I've started using a new site, Tipday, which lets me make tips for free and find out how much I would have won - or lost - if I had bet real money. I can see everything on a simple chart and it even splits my results up by sport. That way I know there are some sports (basketball) where I do better than others (soccer). Tipday also lets me follow other tipsters so I can take a look at the most successful guys and get an idea of how their minds work. With leaderboards running the whole time, I can see how I stack up against the best and even win prizes for making the most virtual 'money'. You don't just have to test yourself against the guys right at the top, of course. You can just as easily use Tipday to compete with your friends to see who really knows the most about sports and betting. 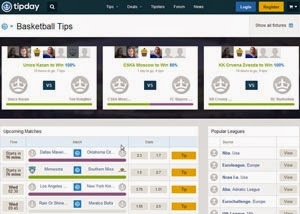 At the moment Tipday lets you make tips on soccer, basketball and rugby, and if you decide to graduate to real-money betting it will help you do that too.